Now in Buenos Aires: ¡Gol Gol Gol Gol! "Estado Sionista, Vos Sos El Terrorista"
Argentina came pretty close to a complete stop this morning as the national team played its second game in the World Cup, beating South Korea 4-1 and taking the lead in Group B with 2 solid wins. Offices and shops opened late; schools adhered to normal start time, but devoted the first 90 minutes of the day to the televised broadcast of the game. The word is this decision was made to prevent the heavy absenteeism that occured during the 2006 World Cup. Although the spontaneous post-game marches to the Obelisk have not yet reached traffic-stopping volumes, futbol fever is already at epidemic levels. The Argentine public television system is broadcasting all the games of the national team and many of the other matches, as well, and the huge Plaza San Martin has been turned into "Fan Park," where multitudes gather to watch the games on a giant screen. Light blue and white - the colors of the Argentine flag and the national team - appear on everything, and Maradona and Messi are the favorite topics of conversation. 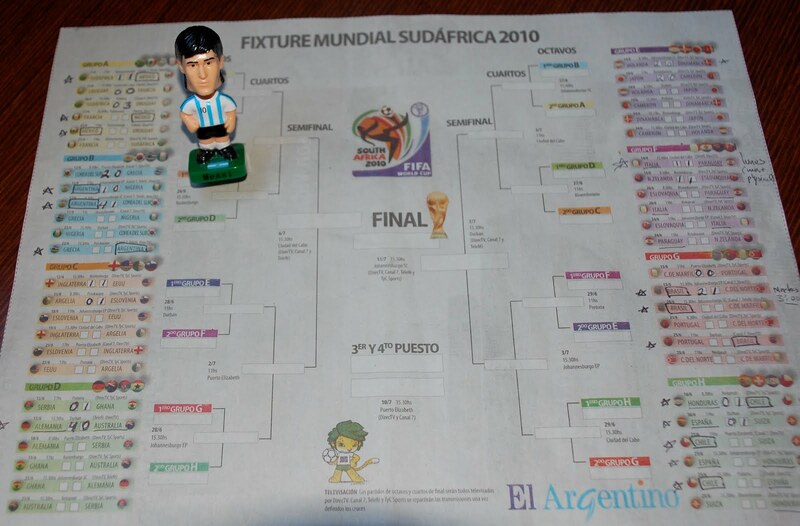 We've got our own little Messi figurine - free with the purchase of a 4-pack of Energizer batteries - watching over our World Cup schedule. Eyes on the prize. ¡Vamos Argentina!